Jesus had another nasty little surprise for the demons Saturday morning! After they had fought all night and withdrew thinking they were going to go to their staging areas and rest, when they got there they found Heaven's Ladies waiting in ambush, and they fell on them and fought them for over two hours and finally withdrew after they had done enough damage. The creatures of Darkness are absolutely irate! The fact that We have spies within their ranks that tell Us every little thing they're doing really, really drives them mad! And We know all their hiding positions, all their plans and everything practically before they make them! If We could only stop them coming in from the planes from overseas, from Africa, and Europe and Asia, if We could find some way of blocking this, but as long as there are perverts on these planes that they can latch onto and use to carry them, they can come. There's got to be some way of stopping them! In Saturday's "Here's Jesus!" He discusses if He had step brothers and sisters, and what His friendship with Demetrius was like. Another one you won't want to miss! So much has been going on that we have forgotten to mention that Kurt Cobain And The Wonders have finally found a replacement for Judy Garland; Ella Fitzgerald has joined the group! She was one of the first people to try out, but didn't seem to click. But a few days ago she came to Kurt and said "I'd really like to give it another try!" and Kurt said "By all means!" So at a recent performance Ella joined the group. When it came time for her number she apologized to the audience for her poor performance before, saying that recent events were deeply troubling her. But that now she was determined to do better because she wanted to help in the effort. Then she did a special rendition of "I'm Beginning To See The Light" and when she was done the audience was up on their feet cheering and applauding! There is no doubt now that for the present The Wonders are whole! Every time we meet somebody new everybody asks "Do you have some special message from Them that will prove it's from Them, that nobody else would know?" Well, Ella Fitzgerald is no different! We're asked for a message from her, and she says "Yes, I've got one! Tell everyone that all I need to succeed is two pennies! If they tape two pennies to a piece of paper, put them in an envelope and send them to me, I can succeed! That is all I need to accomplish what I want to do! If you send out this message there are those that will recognize it and know that it is from me, and could be from no one else, that only I would send this message!" So that's the message we're sending from Ella Fitzgerald! All she needs is two pennies to succeed, that she wants her friends to put two pennies in an envelope and send them to her. Then she will succeed! Guess what? Gerald was sitting at his work table Sunday when the folding chair he's used for months broke. He banged his head on the wall and twisted up his leg under the table. The creatures of Darkness are working overtime! We made a video telling about it. Here's the link! 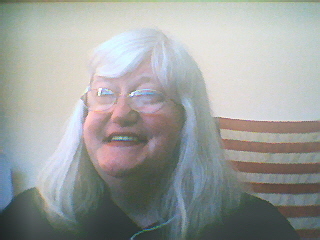 A picture of Speaker Linda Polley from the new camera angle. Doesn't she look like a cute little imp?